São Paulo rappers are remaking the cultural space of the city. We’ve joined forces with AAA’s public education initiative “World on the Move: 100,000 Years of Human Migration” to run an ongoing series of articles on migration and displacement. Click here for all World on the Move articles. Current events continue to remind us that migration is a matter of urgency. Political leaders and community groups feel under pressure to respond to what they perceive as a sudden threat, an invasion of irreconcilable difference. Humanists tend to interpret these encounters as critical moments of human rights violations and exploitation. The rush of collective anxieties and feelings of fear often divert attention away from the more sustained visibility of settlement or what a cadre of mobility scholars call “emplacement.” Far from the traditional notion of essential roots based in time immemorial, the practices of making place are not at odds with mobility but, in fact, part of the present moment of globalization. Contemporary cities, in particular, make this increasingly obvious. In this brief essay I call attention to how inter-cultural networks, in this case between Haitian and Brazilian rappers, street dancers, and graffiti artists, produce commerce through new uses of urban space. The Global South is a major player in human migration and a partner in knowledge production. 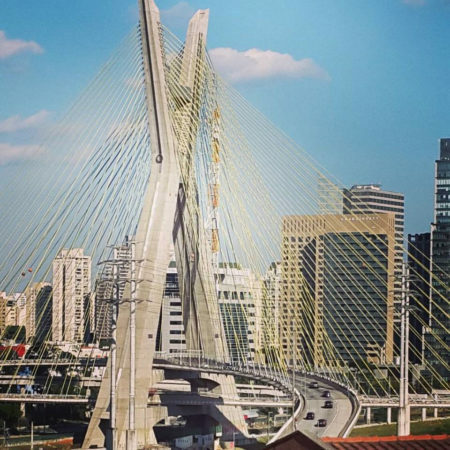 Since 2012, Brazil’s largest city São Paulo has emerged as a migrant destination. The increase in travel to São Paulo is not a new migatory trend, but one that follows generations of intense African slave trade and later Southern European and East Asian migration. During the Portuguese colonial period (1500–1822) and the subsequent monarchy (1822–1889), Brazil was a primary destination for the transatlantic slave trade. São Paulo’s recent population rise, beginning in the months following the 2010 earthquake in Haiti, is due initially to growing economic opportunities throughout Brazil and favorable foreign political relations established during the first decade of the 21st century. The documentation process is relatively quick and cheap, and in São Paulo there is a growing infrastructure of institutional support. São Paulo’s pull factors combine with a series of push factors, ranging from violent wars (Congo, Nigeria, Syria) to political turmoil (Angola) to natural disasters (Haiti) to widespread economic downturns (Senegal and most of West Africa). Hip hop is one medium through which young Haitian men, in this case, have recast themselves as local rappers and in so doing reinforce a tradition of linking urban periphery cultural production with downtown cultural commodification. I focus on these “new Africanos” because their presence provokes a reconceptualization of race within debates around migration and urbanization—particularly curious in a country significantly built on African labor and the ideologies of racial mixture. We have witnessed, for example, violent expressions of xenophobia and racism among older migrants—those who consider themselves native Brazilians—against Haitians, Congolese, and Senegalese. “Ebola carriers,” and “Welfare queens riding the tails of Dilma’s communist policies [former president ousted in a recent coup]” comprise some of the common epithets. The presence of new, black migrants also demonstrates “insurgent citizenship”: an organized counter politics that destabilizes configurations of power. Examples include elected West Africans as members of municipal advisory councils and Haitians employed as training staff for public health care providers. What is insurgent is that a range of new public spaces have become valuable for collective organizing and inter-cultural dialogue. In my current research project, I have identified three types of sites in which African migrants are remaking São Paulo: residential/dwelling, commercial/cultural, and religious. I realized that to appreciate the dynamics of the squatter movements or the new evangelical congregations, I needed to expand my purview beyond the immediate vicinities of downtown tenement buildings or storefront churches. I needed to focus also on the trajectories of urban mobility and accompanying social encounters. We find parallels with expressive culture as well. In the 1970s, the vertical shopping mall Galeria Presidente was a meeting place for early Black Power movements, and people involved in música black (black music). In the 1990s, when I first started conducting fieldwork, the Galeria was the place to traffic hip-hop styles and knowledge, along with other popular culture identities including reggae and heavy metal. Today, the mall is almost exclusively an African space with networks developed through scores of languages other than Portuguese. The mall is a dense, complex web of several kinds of commerce and services, including food, music recordings/studio production, fashion, hairstyle, groceries, and remittances. Rap music holds a special place here because the mixed tapes sold and event flyers distributed are increasingly the product of inter-cultural dialogues. This convergence of musical styles often takes place in the periphery to be later distributed and commercialized in the Galeria. 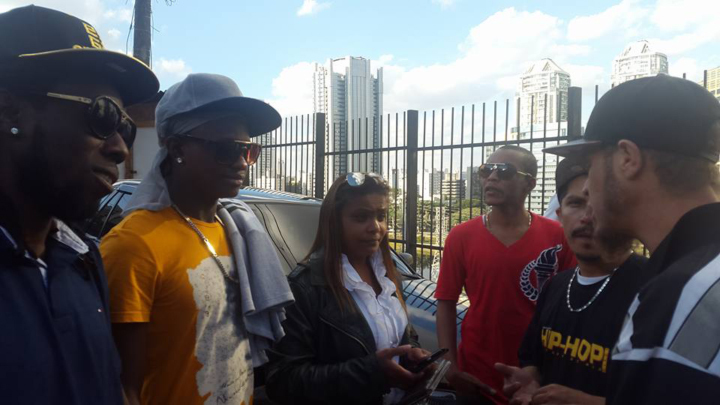 One such example is the partnership between Surprise 69, a group of three Haitian rappers and a Brazilian DJ, and Z’Africa Brasil, a veteran rap group from the Southside of São Paulo with four Brazilian members. During my initial fieldwork for this project (January–July 2016), I observed a rift between migrant interest groups located downtown and coordinated by Brazilians, and those active in the urban periphery and run by immigrants. Unsurprisingly, the issues revolved around agency: Who should speak for migrant experiences and political concerns? My idea was to use hip-hop as a medium of approximation and cultural production. So, after months of planning, veteran street dancer Banks and I scheduled an afternoon for Surprise to meet Z’Africa in Real Parque. Real Parque is a neighborhood located on the “other” side of the Pinheiros River, a natural landmark that generations ago acted as the margin between city and country. First built in the 1950s as an improvised squatter community by indigenous migrants from the Northeast region of Brazil, Real Parque is situated on a hill overlooking the Berrini Avenue area, one of the densest concentrations of wealth in South America filled with several corporate headquarters and luxury hotels. Banks and Z’Africa Brasil frontman Gaspar cut their teeth during the 1990s, gaining experience in workshops sponsored by municipal departments of culture aided by the general popularization of hip hop’s four elements (rap, DJ, graffiti, and street dance). Banks joined the legendary B-boy/girl Backspin Crew, and Gaspar formed Z’Africa Brasil, a rap group in homage to the 17th century Afro-indigenous maroon warrior Zumbi. I met Banks in 1999 and Gaspar in 2002. The 90s was a boom era for hip-hop and the massive success of local heroes, such as Racionais MCs and Thaíde e DJ Hum, drew the attention of disenfranchised youth and young scholars. 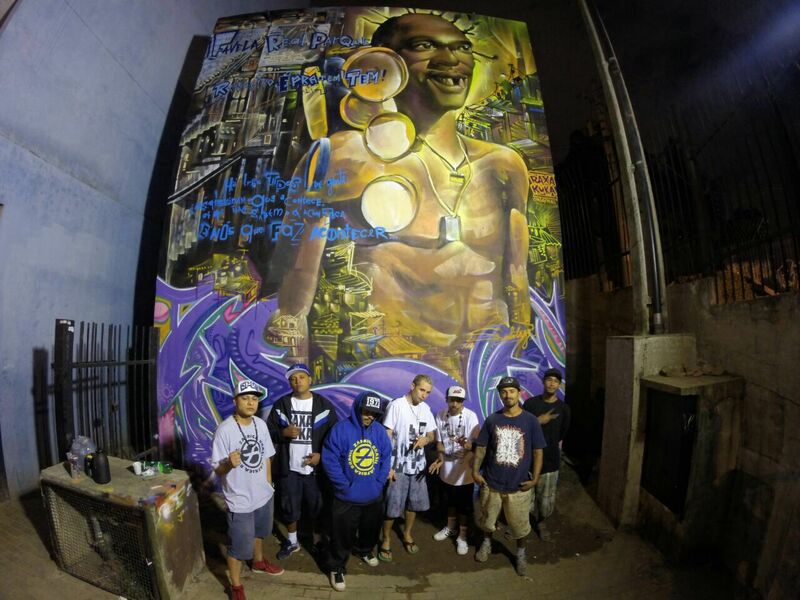 Scores of publications emerged from Brazil’s elite universities with the takeaway message that hip-hop describes a reality that is increasingly prevalent among Brazilians. Importantly, hip hoppers alongside a heterogeneous group of cultural activists recast the urban geographical terms “periphery” and “marginal” as positive, self-affirming cultural identifiers. This pride continues in new expressions, such as marginal literature and slam poetry, organized in dozens of sarau or open microphone events each day. I met Surprise 69 in February of 2016 at a GRIST (Group of Homeless Refugees and Immigrants) planning meeting. The group formed in Peru, a common stop for migrants on their way to Brazil. On July 2, 2016, I arrived for the Surprise and Z’Africa Brazil meeting with my 11-year-old son and Ralph, an aspiring Haitian rapper. Banks and his Real Parque crew opened up their homes, offered food and drink, cued up the Surprise 69 demo songs from their pendrive, and told us about the transformation of the neighborhood after the 2010 wildfire from a shantytown into a public housing project. Gaspar arrived with a wide grin and his hand extended. He took center stage and told long stories about his recent trip to Montreal, Canada and his memorable meeting with the Haitian artist Vox Sambou. This meeting got Surprise members’ attention, “Let’s record a little something, and I can send it on to Vox Sambou. He has WhatsApp. We are constantly in touch… Let’s do this!” Gaspar urged. They framed the song they recorded as a conversation on racism and its role in humanity, a story with a long history in Brazil and one with new contours and significance in present day São Paulo. Hours passed as we drank and exchanged cards, lyrics, tracks, T-shirts, and tall tales. Local graffiti artists completed the mural in homage of the great rap martyr Sabotage, and everyone posed for photos and selfies. We were all posturing. By way of conclusion, I echo the pithy statement of Brazilian researcher Patricia Costa when she confessed, “I realized that to migrate is to accumulate stuff.” For African migrants, it is an accumulation of vulnerability as well as an opportunity to accumulate cultural capital. Hip hop is one medium through which young Haitian men, in this case, have recast themselves as local rappers and in so doing reinforce a tradition of linking urban periphery cultural production with downtown cultural commodification. This spatiality is a product of the encounter, which is increasingly common in global cities. By developing my analysis of the Galeria Presidente and other active sites of migrant emplacement, I suggest that not only are places products of social interaction but also that these locations are parts of circuits held together through urban mobility. Migrants’ use of the city, whether in enclaves of affinity or multicultural interest groups, is producing the new constitutive spaces of São Paulo. The overall lesson is a spatial one—migration reshapes cities through encounters and should provoke us to rethink how we “measure” the impact of migration as well as how we theorize the urban. Derek Pardue is associate professor and coordinator of Brazilian studies inside the Global Studies Department at Aarhus University, Denmark. He will be a senior fellow at the Hanse-Wissenschaftkolleg (HWK) in Germany during 2017–18.